(1.1*55*1000*1000)/1000000 = 60.5 ~ 60 seconds. So to build a 5 minute timer circuit, we would be simply changing the resitor value to 272.7k ohm in above given 1 minute timer circuit. Similarly to create a 10 minute timer we would be changing the resistor value to 545.4 k ohm. As per above calculations, for a 15 minute timer circuit, we need the value of resistor to 818.2k ohm. We should note here that we have used LED at reverse logic, means when OUTPUT pin 3 is low, LED will be ON, and when OUTPUT is HIGH then LED will be OFF. So we have calculated OFF time above, means after the calculated time LED will be turned ON. LED will be ON initially (OUTPUT PIN 3 LOW), as soon as we press push button (trigger the 555 via TRIGGER PIN 2), the timer will start, and LED will become OFF (OUTPUT PIN 3 LOW), after the calculated time duration, PIN 3 will again become LOW, and LED get turned ON. Sooooo, for how long does it remain lit up? As we have used 555 timer in Monostable mode, it will remain ON untill the next trigger (button press). Here, ON state is Stable state and OFF is Unstable state. Can this be used to turn off a signal? ie. could I use it to turn off a switch instead of being ON. We have connected the LED in reverse logic here. To Turn On the LED just connect the positive terminal of LED to PIN 3 of 555 and negative terminal to Ground. I want the circuit to switch ON the LED / motor say once in 24 hrs and automatically switch OFF after (say) 30 secs or 1 min (after switching ON). How can this be achieved. 555 Timer IC is not reliable for timers, greater then 10-15 minutes, you should check out IC 4060B for larger duration like 24 hours. Hi, I tried the 15 min timer with the reverse logic(LED is off before the trigger is pressed,but as soon as I power the circuit,LED blinks and is OFF after that irrespective of trigger button being pressed. Thank you very much for your explanation. It looks great to me, however, is it possible to make the blinking LED (OFF for 2min and ON for 50 sec)? I do not know how to circuit it. Please kindly help me. Yes it can be achievable, you need to configure 555 in Astable mode and change the resistor R1, R2 and capacitor C1 accordingly, check here: 555 in Astable mode. There are lot of 555 calculator available online to calculate these values. It is a nice work. I would like to use the circuit to control an incubator, how do I go.abut it? You can do that by configuring 555 in Astable mode, check here for more detail: 555 Timer Astable Multivibrator Circuit Then calculate the value for R1,R2 and C1 for 10 min off and 10 min on setup, by using some online 555 calculator. LED, can you help me? I want to turn on my certain circuit for 30 minutes and after 30 minutes i want it to be off state. Does this circuit can sort out my problem. Moreover, I want the output of the timer circuit to be 14V, is it possible?. 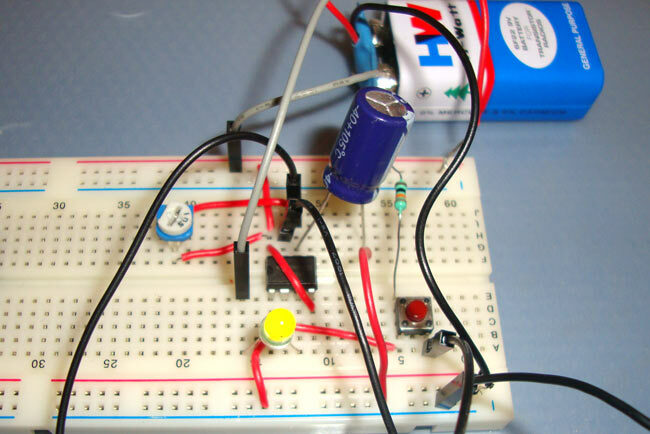 Connect the LED in opposite direction and make the timer of 30sec using given formula. can i use this circuit to make 30 min timer? or should i use another ic? For 30 minutes IC 555 is fine, but 555 Timer IC is not reliable for greater time duration you should check out IC 4060B for larger duration like 24 hours. Error in schematic, R1 must connect to pin 2 of the 555 to keep Trigger pin 2 high untill you push the switch! I want an electronic timer that will accurately time up to five minutes in one-minute steps before giving an audible (pulsing) or visual (flashing LED) warning that time is up. Thanks for the wonderful post here. Please I want to build a timer circuit that will be activated by another circuit and the timer circuit should run for 5minutes before turning off automatically. A manual override can also reset the circuit to make it ready for another triggering. Please can I modify this circuit to achieve that? It's more like a delay circuit with automatic and manual reset. Thanks a lot in anticipation of your kind assistance. Please help me with this circuit.. It is possible but circuit will become complex, you may need to use 2 or 3 555 ICs and Op-amp, better use some Microcontroller. There are flaws with the circuit, the 10K resistor top left is simply connected all the time between +9V and ground -ve rail thereby drawing power for no useful purpose, you need to connect 10K bottom leg to the pin 2 of the 555 timer, so that it is held at 9V+ through this 10k (pulled high) so when you push the switch then pin 2 goes low (-ve) to trigger. secondly if you use bigger capacitors like 1000uF, your timings are going to be miles out, as there is usually very large leakages on higher the capacitor values are, so this circuit may not time if you use very large value capacitors, one should make sure the leakage current is less than the timing current through the variable timing resistor. thirdly, when the timer trips, the large 1000uF cap will have stored so much charge on it, and all of it will be discharged when next arming the timer, this means all of that energy stored in the cap will dissipate suddenly when you press the button and can cause failure. Can i make this led connected in a manner,so when i push the button it will be "ON" for 5 minutes. Yes we are grounding the PIN 2 on button pressing to trigger the 555 timer, learn more about 555 here. I need to make a circuit that when the switch is momentary pushed, it starts the timing circuit on for 15 seconds, however, if the same button is pushed again within that 15 seconds, it cancels the timer and turns the output off. push it again and starts the 15 seconds on again. so its using one switch to start and stop the timing circuit. i cannot seem to figure out how to do it using only one switch. can anyone help me? Why where did you get stuck? What will happen to circuit if the key is permanently closed? Hi, do you have a fully component list. What type of button do you use? And LED? With spesification like how much current it can take before it breaks etc. Hi. Maybe u could help me. This project is for an airsoft game. I need an alarm to go on every 5 minutes , and stay on for like 5-10 seconds. Hi, thank you very much for this very helpful circuit. Can I ask a favor? Can you please modify the circuit so that it will use a series of LEDs, one for 1 minute, another for 3, for 5, for 7 and 10? Thank you very much in advance. I have tried this circuit, i have wasted more than 10 LEDs, then i have used an 1k resistor for the LED, then also the circuit is not working what can i do for it.......?????? I need to make a circuit that i can put a timer on for 1,2,3,...,10 minutes then once the time is over whatever device is connected to the circuit will automatically shutdown/turn off. Is there anyway i can modify this circuit to match my needs?